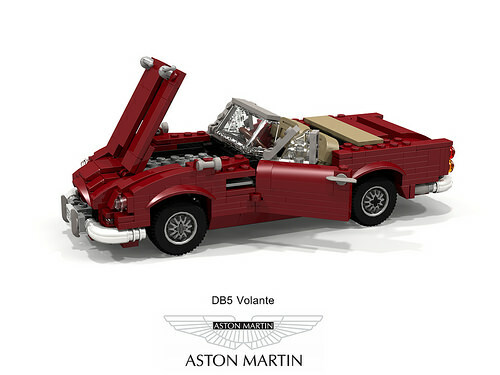 The Aston Martin DB5 is famous for being the most recognised cinematic James Bond car, and builder Peter Blackert has released his latest creation, the DB5 Volante, from the garage just in time for the new Bond film. The Aston Martin DB5 is a luxury grand tourer released in 1963, made by Aston Martin and designed by the Italian coachbuilder Carrozzeria Touring Superleggera. The DB5 was first used as Bond’s car in Goldfinger in 1964 and was destroyed in Skyfall in 2012. 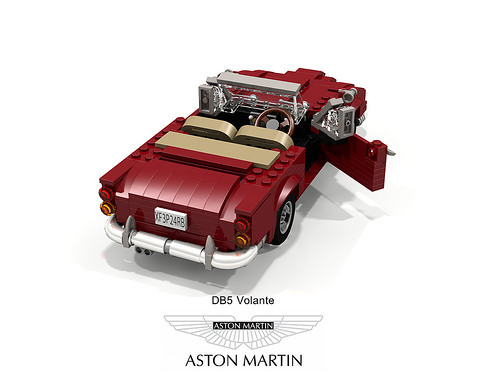 I haven’t seen the new Bond film Spectre yet so I don’t know if Bond’s DB5 has recovered to make an appearance, though it is confirmed that Bond will drive a brand-new DB10 which was designed specifically for Agent 007 by Aston Martin. At first sight Peter’s DB5 appears luxurious with chrome detailing, a soft tan leather interior and maroon bodywork. Look closely and you will see ingenious use of minifigure accessories such as ice-skates used as door handles and registration plate holder, or binoculars for the exhaust.